Call 091 722 131 to book. Visit one of Galway's best known Pubs. 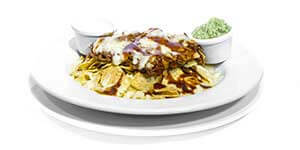 Catch all the games here! Download The Sliding Rock Menus! 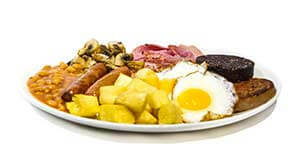 2 Bacon, 2 Eggs, 2 Sausages, Black & White Pudding, Mushrooms, Beans & Fried Potatoes served with toast and your choice of Tea/Coffee. 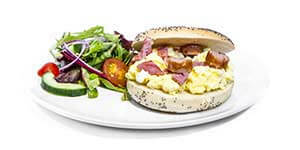 A fresh baked Poppyseed Bagel filled with Egg, Cheese, Bacon and Sausage. 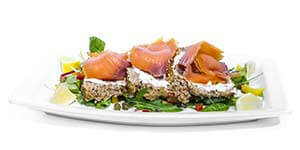 Oak Smoked Irish Salmon served with homemade brown bread, citrus mayo and capers. 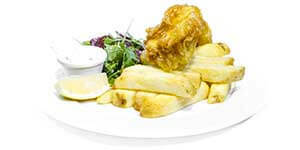 Freshly Caught Cod, Deep Fried in our Own Beer Batter. 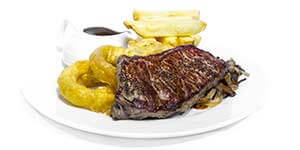 8oz Sirloin Steak, Onions, Mushrooms, Home Cut Fries, Battered Onion Rings with a Peppercorn Sauce. Let us know if you have any special requirements!